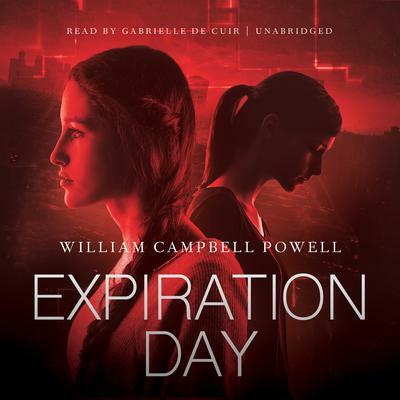 The novel Expiration Day by William Campbell Powell was published on 22nd April 2014, by Tor Books of New York (a Macmillan imprint). If you're a blogger / reviewer / agent , get in touch via the contact page and ask for a Netgalley review copy for your eReader. "It's a rare event when one hears an audiobook that expands one's mind and breaks one's heart at the same time. De Cuir makes every last word of this first- person story come alive with an adolescent's hopes, doubts, and dreams." I'm so chuffed! Skyboat Media 's audiobook of Expiration Day has been awarded an "Earphones" by AudioFile Magazine . ORIGIN 1950s: from dialect chuff "plump or pleased"
I'm delighted to announce that Skyboat Media has produced Expiration Day in audiobook form, for release on 12th April 2016. The book is narrated by Gabrielle de Cuir (@GiftoGab ), whose narration credits include Orson Scott Card's Enders Game. Expiration Day is distributed by Blackstone Audio and is available at downpour.com as electronic download and Mp3 CD and from Amazon as Mp3 CD. Gabrielle de Cuir, award-winning narration, has narrated over one hundred titles and specializes in fantasy, humor, and titles requiring extensive foreign language and accent skills. She was a cowinner of the Audie Award for best narration in 2011 and a three-time finalist for the Audie and has garnered six AudioFile Earphones Awards. Her �velvet touch� as an actor�s director has earned her a special place in the audiobook world as the foremost producer for bestselling authors and celebrities. I'm very proud to be at Sasquan (World Con) where Expiration Day has just won the Hal Clement Award for Excellence in Young Adult Science Fiction. Very happy that Expiration Day has picked up an Honorable Mention in the 2015 Westchester Fiction Award . The Compton Crook Award is for debut authors in the Science Fiction, Fantasy and Horror genres, and is run by the Baltimore Science Fiction Society . The award will be announced in April, leading up to Balticon in May. It's a tough shortlist with some excellent new authors on there. There are a couple of other Tor authors there, so kudos to Tor for investing in new talent. And there's a very fine novel that I've already read and reviewed - Emmi It�ranta's Memory of Water .